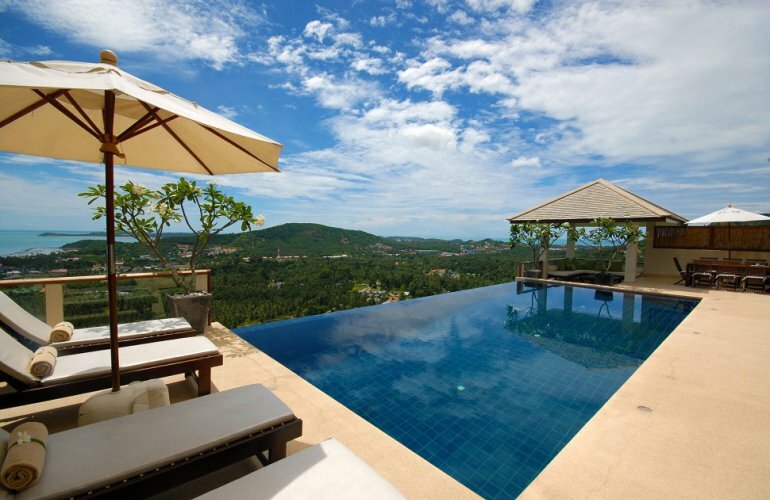 Set high in the hills overlooking the northeast coast of Ko Samui, this four bedroom villa is designed to take full advantage of the phenomenal views afforded by its location. With its own infinity edge pool, extensive sun deck, steam, sauna and fitness room, this holiday villa is ideal for a group of friends to share. This villa is perched on the hills amidst a sea of green and tropical flora, with the blue ocean and neighbouring islands in the background. It is just a 15 minute drive from the International Airport on Ko Samui, and to Chaweng, the island's main tourist resort. Close by is the interesting Fisherman's Village at Bophut with its range of cafes, night spots and top class restaurants. This is a unique and quite extraordinary holiday location, offering outstanding facilities, luxurious decor and furnishings, total privacy and views that never fail to astound. Contemporary styling combined with a design that showcases the stunning outlooks enjoyed by this villa, this is a superb base to explore the beauty of the island. If you choose to stay at home, you may be kept busy! There's a sauna, steam-room and a fully equipped home gym on the villa's lower level, and of course the infinity edge pool at the central level overlooking the hillside towards the ocean. Or - simply relax and enjoy those phenomenal views from the pool deck, the pool itself, or indoors from virtually every room ... To enhance your relaxation enjoyment, there is an iPod dock in the living room for guests to enjoy their own choice of music, and there is also complimentary Wi-FI Internet access throughout the property. Entering the villa through the main gates there is a beautiful water feature to the left, setting the Thai tone of harmony and tranquillity, and welcoming you with the subtle sound of flowing water. As soon as the front door is opened, a panoramic view opens up before you. There are three bedrooms on this upper level: two double en suite bedrooms, one with a king size bed and the other with two single beds; and the magnificent master bedroom, which has a king size bed. All the bedrooms are individual in design and decor, and all have air conditioning, their own satellite TV/DVD system and a private safe. The large en suite bathrooms feature walk-in showers, terrazzo bathtubs strategically placed for optimum views. A staircase from this upper level leads down to the main living room which is a vast open plan sitting, dining and kitchen area. It has floor-to-ceiling glass doors which open onto the sun deck and the pool, and of course those fabulous views are always in full sight, just through the windows. The sitting room is furnished in cool cream soft sofas, wooden coffee tables, with restrained but colourful accessories, plant pots and wall art. The wood dining table can seat eight guests in comfort and the kitchen is a fully equipped western style gem of wood, steel and marble counter tops, with a set of units creating a division between the kitchen and the dining area. The fourth bedroom is on this level, to the left of the terrace, and has doors opening straight onto the pool deck. This room has a king size bed and its en suite bathroom enjoys the same level of design and facilities as the others, and has a wide panoramic view over the Samui hills and the sea. To the right of the main living area is a sala equipped for both relaxing and dining al fresco. This sala is positioned at the very edge of the terrace to ensure unobstructed views can be enjoyed whilst dining. The final staircase leads to the lower level fitness area. Due to its location and design, this villa is not suitable for young children.